Welcome back, everyone! 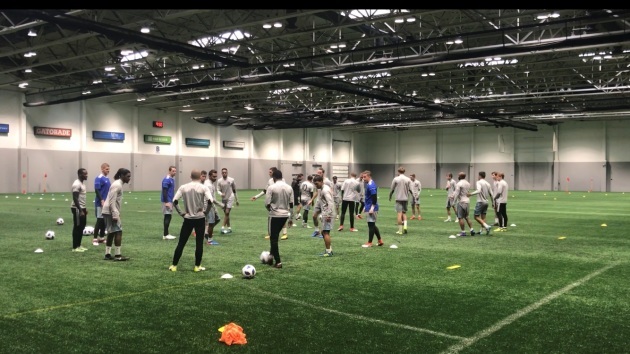 Minnesota United's 2018 preseason is off and running (minus Monday's blizzard snafu). In all, 26 players have reported for this first session at National Sports Center. The only ones missing are forward Christian Ramirez (U.S. national team duty), winger Frantz Pangop (Cameroon national team duty), winger Johan Venegas (on loan) and defender Vadim Demidov (the saga of his removal from the team continues). One trialist is on board, Shae Bottum from St. Thomas. He was recommended by St. Thomas soccer coach Jon Lowery, who filled in as United's goalkeeper coach at the end of last season. He's a 6-2, 175-pound midfielder/forward from West Lakeland. He just finished his senior season at St. Thomas, where he started all 24 games, scoring nine goals with 15 assists. New guys defender Tyrone Mears, midfielder Harrison Heath (coach Adrian Heath's son) and goalkeeper Matt Lampson were all present and accounted for, as were the draftees -- forward Mason Toye, defender Wyatt Omsberg, defender Carter Manley and midfielder Xavier Gomez. Other notable attendees include midfielder Rasmus Schuller, who is back after ending last season with a successful loan stint back in his native Finland. Midfielder Sam Cronin is also back after he finished last season with a concussion. For those asking, here are the kit numbers for the new guys. I must stress that these are not technically official, and thus subject to change. But anyway, Mears No. 4, Heath No. 16, Omsberg No. 30 and Manley No. 2. Not all guys were wearing their numbers, so yeah. Also, NSC has been through quite a few changes since I was last here in the fall. There's new turf in the stadium as well as new fenced-in grass fields behind it, all for the team's use. The coaches' offices were revamped and expanded, since the lobby area behind the box office is now mostly walled -off. The team's locker rooms and such were redone last season. With the exception of some branding and refurbishing the cafeteria, the place is almost done. Should be another week or so. "The club has done great to up the facilities throughout," coach Adrian Heath said. "The changing rooms and the new training facility, the pitches outside and indoor, are first-class. We have no excuse about the facilities. This is a good environment to work in for a week. This will be the buildup week, and then we'll get down to real football work down in Florida on the grass." Also, the club has alluded to another signing for several weeks since Frantz Pangop signed earlier in January. That signing -- another Cameroon player -- is still coming, it's just a paperwork holdup. It's looking likely the player will join United while the team is in Florida sometime Jan. 28 to Feb. 10. There might be some questions of yours I answered over on Twitter that I didn't put in this blog, so feel free to check out my timeline here. I'm planning on doing a series of blogs/Q&As in the next weeks featuring all the new players (and some of the old) so you can get to know/catch-up with them. So look forward to that.